(March 6, 2017) -- East Portland's first Speed Safety Cameras are now operational on SE Division Street and SE 122nd Avenue and will begin issuing warnings today to drivers who exceed the posted speed limits on those high crash corridors, the Portland Bureau of Transportation announced. The goal of the Speed Safety Cameras is to reduce speeding and save lives. 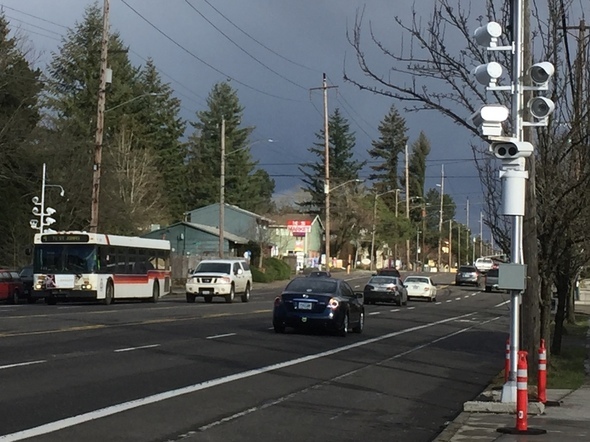 Safety cameras along SE 122nd Avenue and SE Division Street in East Portland start issuing warnings today to drivers who exceed the posted 30 mph speed limit along SE Division Street and the 35 mph speed limit along SE 122nd Avenue. The 30-day warning period will end on April 4, with citations starting the following day. The safety cameras activation on SE Division comes just four days after the Portland City Council unanimously approved an emergency speed reduction from 35 mph to 30 mph that was proposed by Transportation Commissioner Dan Saltzman, who oversees PBOT. "Last year, we had more fatal crashes on our streets than we have had in more than a dozen years," Saltzman said. "That’s unacceptable, and it doesn’t have to be this way. The emergency speed reduction on SE Division, coupled with these safety cameras and more improvements coming soon, will save lives." Transportation Director Leah Treat said the safety cameras are a key initiative in helping Portland reach Vision Zero, the goal of eliminating fatal and serious injury crashes. "Safer streets for all Portlanders is my number one priority," Treat said. 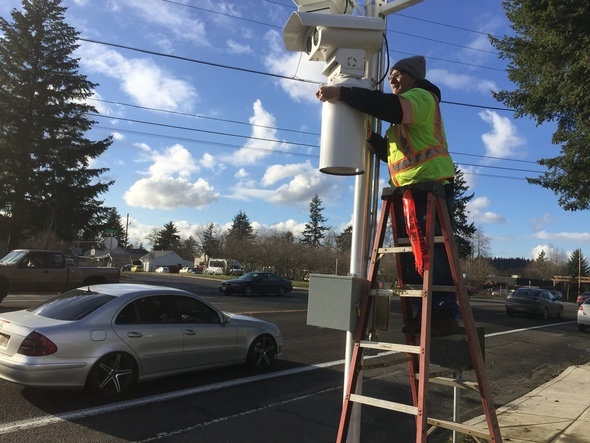 "Since we installed safety cameras on Beaverton-Hillsdale Highway, we have seen people begin to change their behavior, which is key to really moving the needle on safety. And when people drive more slowly, our streets get safer." Speed Safety Cameras were installed along Outer SE Division earlier than expected, because the City Council called for PBOT to fast-track safety improvements in the area, where five fatal crashes occured in 2016. Photo by Dylan Rivera, Portland Bureau of Transportation. Multnomah County Commissioner Jessica Vega Pederson, Portland Fire Chief Mike Myers and Capt. Michael Crebs, of the Portland Police Traffic Division joined Saltzman and Treat at a news conference today to mark the activation of the cameras. Cameras are being installed on SE Division sooner than expected, because the Portland City Council passed an emergency ordinance in December, calling for PBOT to fast-track safety improvements in the corridor after two fatal crashes there on Dec. 7. More than half of deadly crashes occur on just 8 percent of Portland streets. These streets make up the High Crash Network. SE 122nd Avenue and SE Division Street in East Portland are among 30 High Crash Network corridors. The rate of pedestrian crashes on SE 122nd Avenue is about 50 percent higher than the citywide average. Analysis of a decade’s worth of crash data found that more Portlanders were seriously injured or killed while driving on SE Division than on any other street. Safety cameras have already proven their ability to dramatically reduce speeding in Portland. The first safety cameras in Oregon started issuing tickets on SW Beaverton-Hillsdale Highway on Sept. 24, 2016, after a 30-day warning period. Before the cameras were installed, an average 1,417 vehicles a day traveled 51 mph or faster, according to readings by a pneumatic tube laid across the roadway. 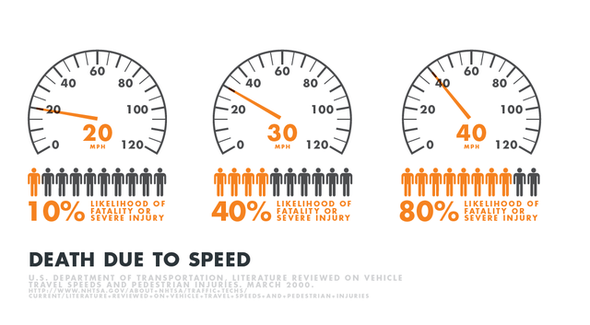 During the warning period from Aug. 24 to Sept. 18, an average 93 vehicles a day were found traveling 51 mph or faster -- a 93.4 percent reduction from the tube count. In the first week of the warning period, cameras recorded an average 115 violations a day. Violations dropped to an average 72 a day by the week of Sept. 12 to 18. 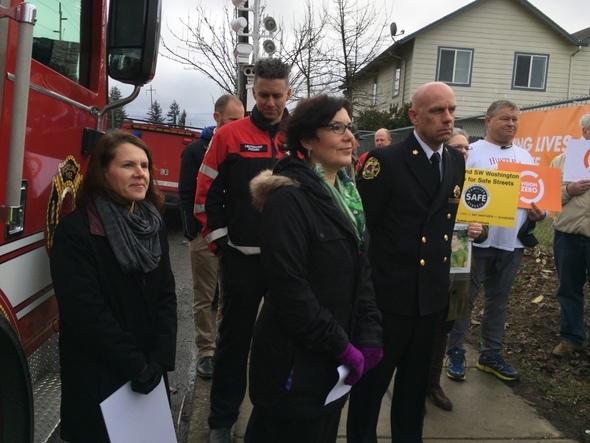 Margi Bradway, PBOT's active transportation and safety manager, Multnomah County Commissioner Jessica Vega Pederson and Portland Fire Chief Mike Myers attended a news conference on the new cameras on SE Division Street. Photo by Dylan Rivera, Portland Bureau of Transportation. Safety Cameras are a proven safety tool that can reduce dangerous speeding and save lives. The cameras are mounted along High Crash Corridors and when people driving past them exceed the posted speed limit, they capture photos and video for review by Portland Police. The cameras will issue warnings for the first 30 days of operation, and issue citations starting April 5. An officer from the Portland Police Bureau will review violations before a citation is issued. Penalties are the same as any other speeding violation. The typical speeding citation in Oregon is a Class C violation (11 to 20 mph in excess of the speed limit) resulting in a $160 fine. By state law, any money received from the tickets can only be spent to pay for the program or for safety improvements. 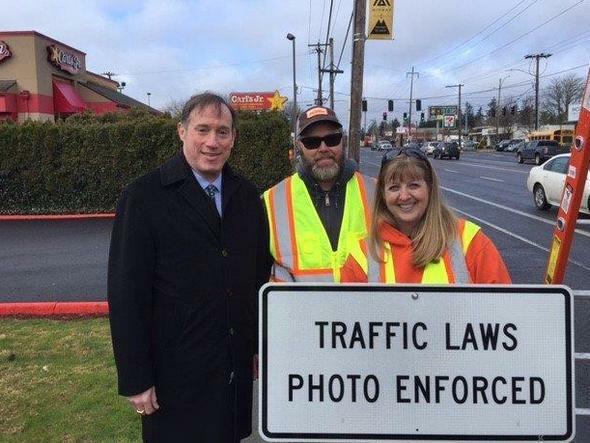 Commissioner Saltzman thanked PBOT's sign crew for installing the warning signs that are part of the safety cameras program, and he helped attach the sign to a utility pole as well. Photo by Kirstin Byer, Portland Bureau of Transportation. The Speed Safety Cameras program provides ample warning to people driving in the area. State law requires speed signage and speed reader boards to be installed, warning drivers more than 100 yards in advance of the cameras in both directions. PBOT staff also conducted extensive outreach with local neighborhood associations as well as businesses and community organizations to raise awareness of the changes along the corridor, before the cameras were installed. Outreach will continue during the warning period. In addition to the new cameras, PBOT is delivering additional safety and maintenance projects. For example, PBOT will enhance SE 122nd Avenue crossings by installing a rapid flashing beacon with pedestrian island and a crossing with a pedestrian hybrid beacon (also known as the High Intensity Activated crossWalK or HAWK) as well as construct new sidewalk and perform sidewalk repair. Accelerate the timelines for federally-funded safety projects on outer SE Division, including the East Portland Active Transportation (EPAT) and Highway Safety Improvement Program (HSIP) projects, for construction in 2017. The projects include pedestrian crossings with median islands and Rapid Flashing Beacons or Pedestrian Hybrid Signals to complement sidewalk infill. Expand the East Portland In Motion (EPIM) buffered bike lane project on outer SE Division St to a multi-modal safety project, with focus in the Jade District and Division Midway Alliance district, that includes additional street lighting, enhanced crossing treatments, and vehicle access management. Install additional speed reader boards at four locations from SE 82nd to the city limits to educate drivers and reduce speeding. A PBOT contractor installs safety cameras on SE 122nd Avenue, near the Springwater Corridor. The cameras started issuing warnings today. Photo by Dylan Rivera, Portland Bureau of Transportation. The first Speed Safety Cameras in Oregon were installed on SW Beaverton-Hillsdale Highway last fall after the City of Portland and community safety advocates convinced the state Legislature in 2015 to pass HB 2621, which allows them to be used on High Crash Corridors in the Portland city limits. The fourth fixed speed safety cameras installation will be on NE Marine Drive later this year. The City of Portland has been using other cameras to supplement speed enforcement for years, with police officers in vans enforcing speed limit violations. Portland also uses cameras to increase enforcement of red lights at traffic signals. About Vision Zero: The death or serious injury of even one person on Portland streets is one too many. Vision Zero is the bold goal to eliminate traffic deaths and serious injuries from Portland streets by 2025. On December 1, 2016, Portland City Council unanimously adopted the Portland Vision Zero Action Plan, which was developed by a 26-member task force made up of agency and community leaders. The Action Plan includes 32 data-driven actions that address the top factors that contribute to fatal and serious injury crashes. The actions prioritize engagement with and investing in traditionally under-served communities. 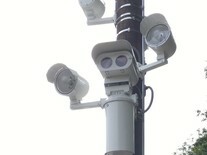 Learn more about Vision Zero and Speed Safety Cameras by visiting www.visionzeroportland.com.